These circular iron steps extend from the ground to the top of 115 feet high Sand Island Light house. Painter Thomas Agos is pictured climbing the stairs. Newsmen who made the climb, found several stops en route are necessary, if one wishes to have any breath left on reaching the top. Archive Editor's note: (1) Somehow, the 1953 reporter had incorrect data, the total height of the structure is 131 feet. A meausrment from the base to the focal plane of the light is 126 feet. 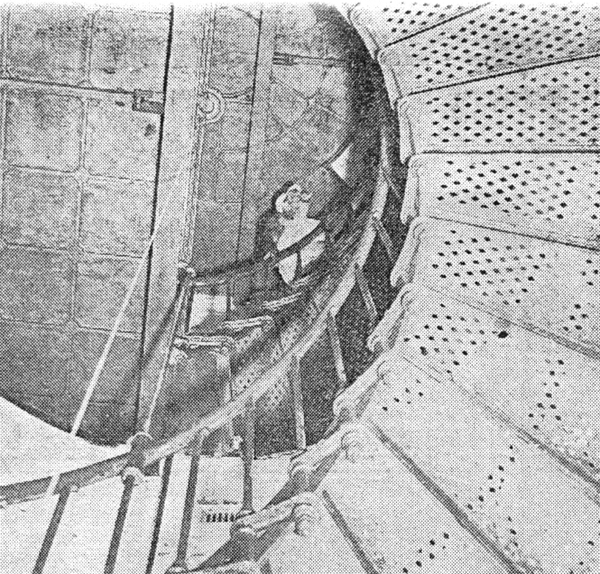 **(2) Eight flights of spiral iron stairs provide access from the ground floor to the watch room where the light was once located. Each of the first six and the final eighth flights makes a half revolution within the tower. A landing is located at the top of each flight. The seventh flight makes a full 360-degree revolution of the tower prior to opening onto the watch room. Anchored within the brick walls of the tower, the iron stairs and landings do not require center supports which results in the tower being open throughout its center from the floor to the top.